The Aotoishi stone from Naniwa has developed a dedicated following among knife sharpeners. The large, brick-like shape ensures a long lasting stone and its efficient sharpening has made it a favorite of many. The name Aotoishi, printed in characters on the stone, refers to its color and identifies it as a whetstone. 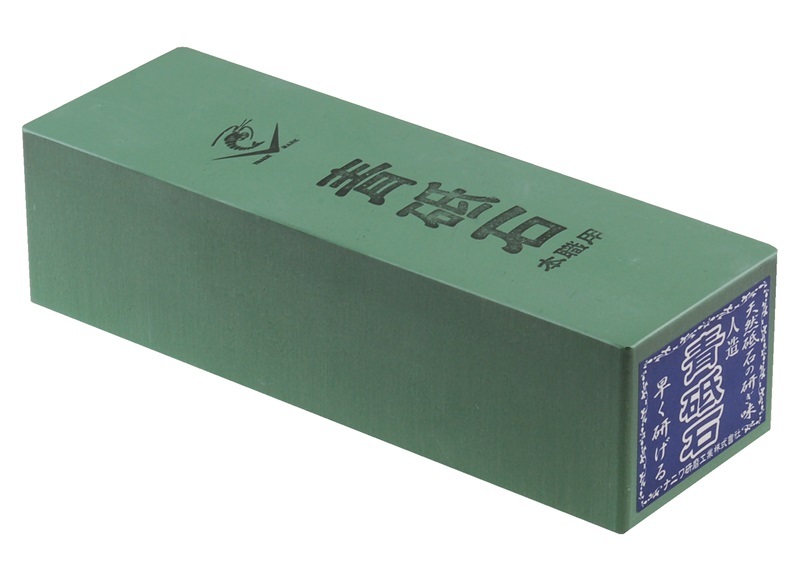 Among its many fans though, the Aotoishi is often simply called "The Green Brick of Joy". The Aotoishi is 2000 grit, making it a jack-of-all-trades stone. It is coarse enough to put an edge back on a knife that is only a bit dull, and yet fine enough to leave a good cutting edge as well. Whether you are looking for a single stone to maintain your knives, or for a middle grit stone to add to your sharpening tool kit, the Aotoishi has it covered. Like other Naniwa stones, the Aotoishi has a foot print of 8-1/4" x 2-3/4" (210mm x 70mm). But unlike all the others, the Aotoishi is 2-1/8" thick (55mm). That's more than 2-1/2 times thicker than the 3/4" (20mm) stones. That extra thickness ensures that this work horse of a stone will be around for a very long time indeed. It's easy to see how the Aotoishi got its nickname, it really is enjoyable to use. It should be soaked prior to use, but it is not as thirsty as many soaking stones and doesn't have to be immersed long. 5 minutes or so is generally plenty to get it saturated and ready to go. This stone has a not-too-hard, not-too-soft feel that gives good feedback when sharpening, and forms a slurry quickly during use. It's standard footprint fits in a stone holder well, but it is massive enough to stay put on its own too, and the extra height provides all the knuckle clearance you could ask for. Q. Which series of Naniwa stones does the Aotoishi belong to? A. The Aotoishi is unique and belongs to a series of its own. A series with a single stone.